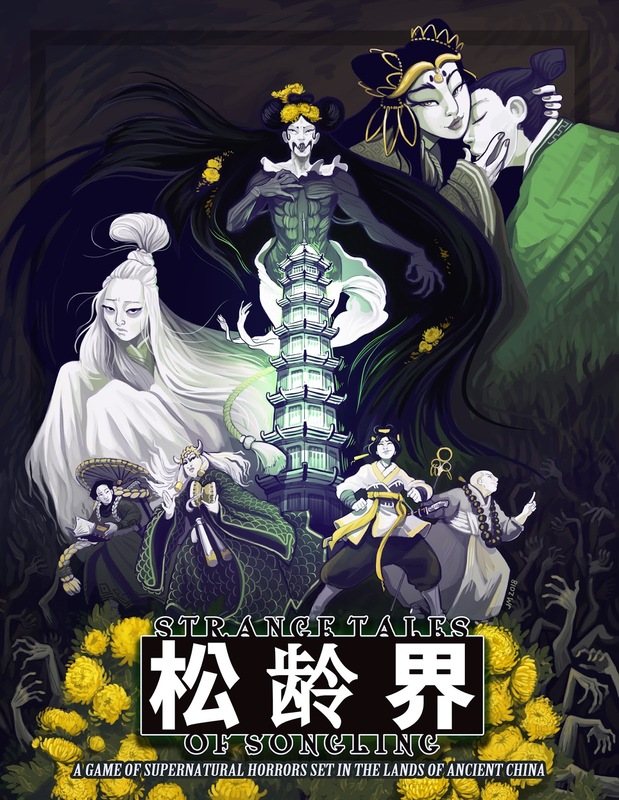 For those who don't know the background, I recently started making a game inspired by the stories of Pu Songling's Strange Tales from a Chinese Studio. It encompasses a little more than that, but for now, that is enough of a description. The setting is simply called World of Songling, and it is a little unusual. I play the world a few different ways. In some cases it is simply a dreamworld, in others it is its own special place. Today, I want to talk about one of the more recent approaches I've been using. I've been playing around with the afterlife in my Strange Tales adventures. Specifically I've been treating it as Chinese Hell, or Diyu. 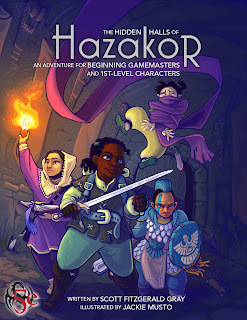 One of the big reasons for this is because I want to fit Strange Tales into my regular gaming schedule and needed to give it a place where it made sense. This works great because whenever a character dies, it can be an opportunity for a slight change of pace as a kind of weekend-in-hell. For example, say a group of characters are fighting a bunch of wicked masters at a temple, and one of them is killed by a poisoned blade during the battle. The dead PC, wakes up in a misty town with strange geography, and human devouring paper lanterns haunting the sky. He finds himself trapped in this world, a shifting landscape that turns out to be the entrance into hell (Diyu). Within this world, he must find some means of escape over the course of several adventures. It could be a simple crawl from the 10 courts of Diyu, or he may simply hop from location to location, villages, temples, manor houses that all resemble real places. The idea is to provide a conceit for a monster-of-the-week. 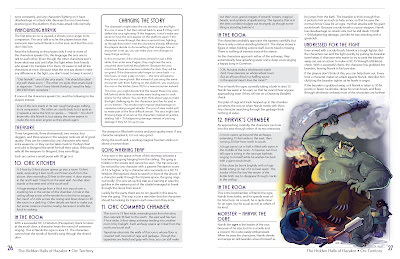 The other players can make new characters who are also recently arrived dead, or perhaps more interestingly, they storm into hell to rescue their fallen friend. Again, these are ideas I am still trying out in various forms in playtests. But increasingly this approach of Strange Tales as an escape from hell, is clicking more and more for me. 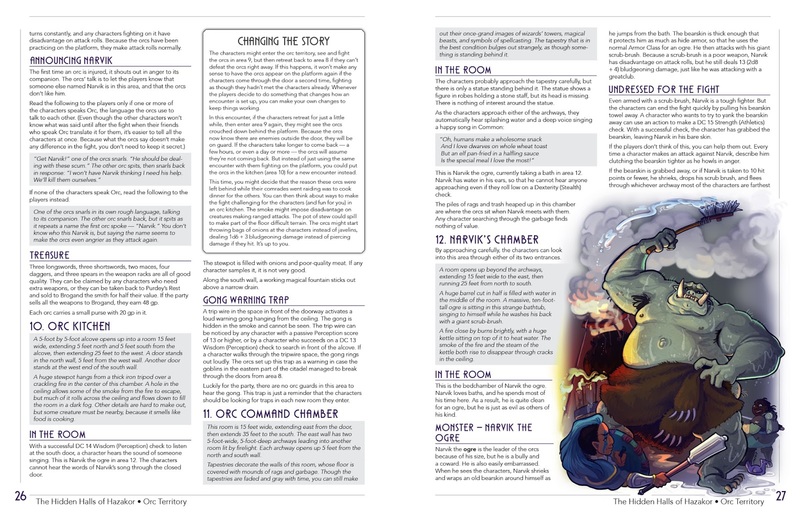 It also frees me up to continue running regular campaigns of Ogre Gate, while occasionally venturing into the World of Songling (which is the ideal place for it to have in my overall campaign schedule). Another way I've been using it, is as a test before rebirth. 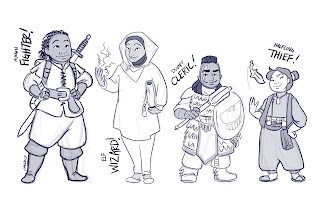 This gets a bit thorny and complex but here the idea is if you have a total party kill, you break out Strange Tales and run 10 adventures for them in the afterlife. Their behavior and performance in these adventures would result in higher or lower rebirth (meaning after those ten sessions I resume Ogre Gate and the players who pleased the Hell Kings get more resources, status, etc; while those who displeased would be born with flaws (importantly this also means more character points at character creation, so it isn't all bad). I still have to work out some of the details here. Ideally it should be simple, so I may just give each character a '+' or '-' for each adventure in terms of how they conduct themselves. Then look at the total amount when it is all done and make a decisions about it. But I am also thinking of making more procedural (however I am striving for Strange Tales to be much simpler than Ogre Gate, so I am more inclined towards the former). I should have more to say on this in the coming weeks. 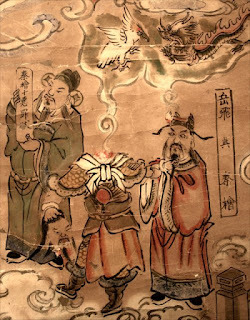 Also, while this really isn't a wuxia topic so much as an account of the strange topic, for categorization purposes, I'm filing all these thoughts under 'wuxia inspiration' to connect it to my blog entries on Ogre Gate. Every Friday we talk about wuxia movies. The past month or so we've also done a discussion of Return of Condor Heroes as Kenny and I work our way through five chapters at a time. Today's movie is A Chinese Ghost Story, an atmospheric and action-packed adaptation of a classic Pu Songling tale directed by Ching Sui-tung, starring Leslie Cheung, Joey Wong and Wu Ma. You can also hear me and Kenny talk about Return of Condor Heroes chapters 31-35. Return of Condor Heroes is a widely loved story by Jin Yong and part of a trilogy that includes Legend of Condor Heroes and Heaven Sword and Dragon Sabre. ROCH follows the adventures of Yang Guo and Xiaolongnu a heroic couple beset by tragedy and at odds with the norms of the martial world. We just have one more episode to go on ROCH so this is a good time to catch up on our previous discussions. You close your eyes and vanish, causing the attack to miss. Make a Meditation Roll against the attack roll. You reappear wherever you wish the following round. Your eyes burn with a maroon Qi energy as you unleash streams of Qi that form into a single column against your foe. Make a Meditation TN 6 roll. On a Success, roll Arm Strike against the Evade of a single Target. On a Success you release five beams of energy from each hand which merge together and do 16 Automatic Wounds (no damage roll). According to legend, when people die they appear before the Eight Magistrates for judgment, to determine how they will be reborn and if they should be punished before rebirth. The truth is most people, even good ones, must suffer some form of penalty. They say that Ruan the Flamingo had many great talents and he forged numerous powerful artifacts. But, some also say, he was a tremendous liar and when he appeared before the Eight Magistrates, this landed him in a good deal of trouble. One of the magistrates took great exception to this and decided to make an example of him. He was sentenced to be roasted for several thousand years over a great flame. This eventually reduced his body to bones, and ultimately a charred skull. Before the skull could be consumed in the flames, a servant of the Ghostly Emperor grabbed the skull and took it to the world of man, where it is believed to remain to this day. This skull has no magical ability that it can impart to its user, but it can speak, and has Ruan the Flamingo's memories of his past and his punishment. 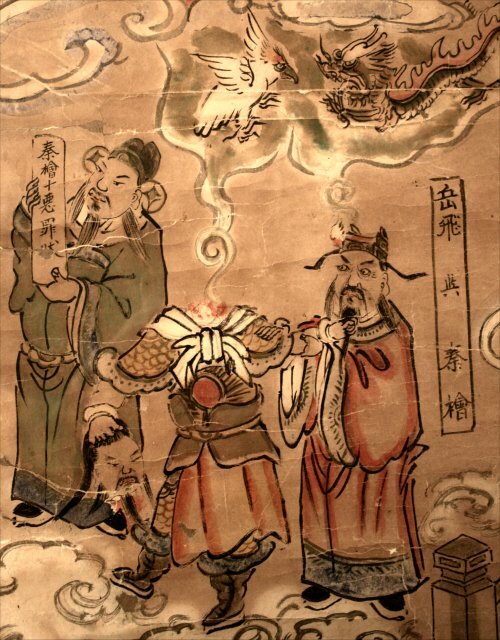 Memories of his punishment are more immediate and so he tends to encourage everyone to live by the Dehuan virtues, lest they suffer his fate. He can also tell people about the time of Sunan and Bao. But more than that, he is a master craftsmen and can advise anyone trying to create powerful objects. Last night on the podcast we finished up our Brave Archer discussion with Brave Archer 3 (we may continue with Brave Archer and His Mate at a later date). This is the story of Guo Jing and Huang Rong, a classic heroic couple from the outstanding Legend of Condor Heroes novels. 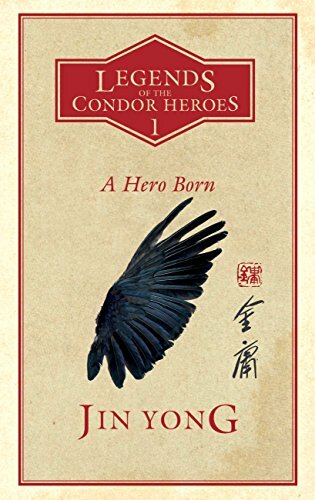 Also, Kenny and I have been going through the Return of Condor Heroes novels, discussing five chapters every episode. This is the sequel to Legend of Condor Heroes. This ancient hemp sack and long hemp cord, once belonged to Du Qian. They seem plain and ordinary. However, they can be used by someone with good Karma (+2 or greater) to capture Jiangshi and similar creatures (the full range allowable is up to the GM). When used against Jiangshi, the cord is infused with a powerful violet energy, and the sack enlarges. The cord can be used with the Light Melee Skill to grab a Jiangshi up to 15 feet away. Roll Light Melee against Evade and on a success, the cord gets it in a Restrain. Once restrained, if you place the sack near the creature, it opens wide and pulls the Jiangshi inside. Then if the bag is wrapped tight with the cord, the monster will remain trapped there for ten years (or until the cord is untied). Here is last week's podcast recording of our Lady Eighty Seven campaign. This is a campaign I am running in Fan Xu province (part of the empire in the Wandering Heroes of Ogre Gate Setting). This campaign is forming the content of an upcoming book (probably just called Lady Eighty Seven or Sons of Lady Eighty Seven) that will provide the groundwork for people to run their own campaign.